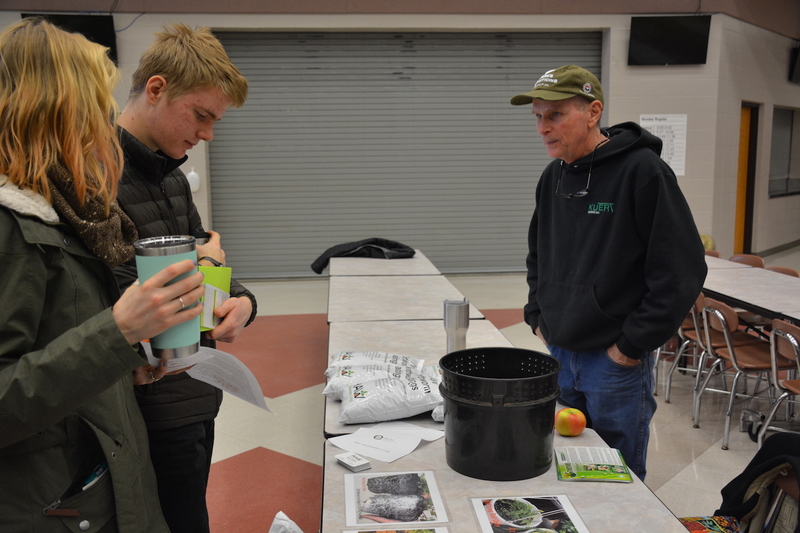 Merry Lea Environmental Learning Center of Goshen College hosted the Michiana Regional Seed Swap January 19 at Goshen High School, Goshen, Ind. Despite snowy weather, eleven vendors, over a hundred guests and thousands of locally adapted seeds came from as far away as Indianapolis and South Bend. While Merry Lea is most known as a nature preserve near Wolf Lake, Ind., it also contains a sustainable farm where seed saving is practiced. Marcos Stoltzfus, director of Merry Lea’s Environmental Education Outreach Team, says the event was a way to support people in caring for the ecosystems that are closest to them: their own backyards. He had attended seed swaps in other areas and was aware that there was not a comparable event in Northern Indiana. Phyllis Miller of the Elkhart County Food Council admires an award-winning honey from Unity Gardens. “It felt like an interesting way to explore issues that are deeply personal to the residents of our region,” he said. John Mischler, director of the Agroecology Summer Intensive at the Merry Lea Sustainable Farm, says that seed saving has been a part of this undergraduate curriculum for years. He teaches it for two reasons: so graduates have the skills needed to adapt plant varieties to their local conditions and because control over plant genetics is a food sovereignty issue. Saving seeds instead of buying them gives people access to healthy, culturally appropriate food and the means to produce it themselves. The seed swap drew a variety of participants. John Sherck, Bristol, Ind., says he grew up thinking that you could only grow corn and soybeans in Indiana. Today, he has an eight-acre farm near Bristol, Ind., where he grows heritage and ancient grains. His business, Sherck Seeds, sells varieties adapted to Northern Indiana. “Every year, I learn more about what else can be grown here,” Sherck says. His offerings include not only corn, barley, rye, millet and wheat, but also surprises like rice and peanuts. Ron Gothe and Judy Alayne Gothe, home gardeners from LaPorte, Ind., came to the seed swap bearing Anasazi beans—a variety they say is hard to find even in health food stores. Anasazi beans were first cultivated by cliff-dwelling Native Americans in the four corners region of the Southwest. Elaina and Kelby Youngberg, Goshen, Ind., visit a booth by RAW Sustainable Living, a farm that produces earthworm castings as fertilizer. Elaina Youngberg, a first-year at Goshen College and Kelby Youngberg, a junior in high school, were drawn to the seed swap because they both love gardening. Kelby has a particular interest in native plants. Visitors could pick up the seeds of wild plants such as monarda, cardinal flower and tall bell flower at a booth staffed by Jan Hunter, president of the Northern Chapter of the Indiana Native Plant Society (INPS). Wild plants nourish beneficial insects, making them desirable in pollinator strips on farms. The chapter serves nine counties across the top tier of Indiana, holding hikes and lectures. 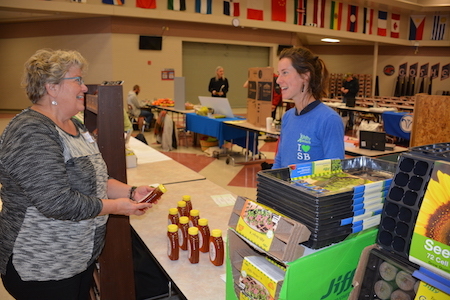 For Phyllis Miller of the Elkhart County Food Council, the seed swap was a good place to network. Her organization strives to improve the health of local food systems and food security. Their work ranges from helping a farmer’s market make the connections it needs to succeed to reviewing census tracts to identify areas that are food insecure. The Food Council’s website provides a listing of restaurants that prioritize local food.